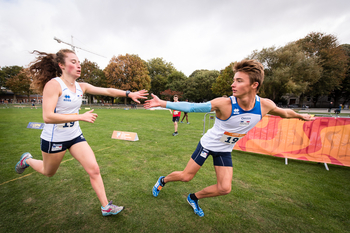 Blanka Guzi and Bence Kardos brought the UIPM 2018 Laser Run World Championships to a happy conclusion for Hungary as they won gold with a strong performance in the Mixed Relay. Kardos (HUN), the individual gold medallist, stood out once again as he dominated the men’s running leg to make sure nobody else stood a chance. Ireland, represented by individual silver medallists Kate Coleman Lenehan and Tom O’Brien, briefly led after an excellent first shoot by O’Brien, but Kardos (HUN) moved into another gear and the Irish had to accept bronze in the end. Great Britain had been given a strong platform by individual champion Jessica Varley, and although Harry Lane struggled with his first shoot, he eventually muscled his way past O’Brien (IRL) to claim silver. Great Britain topped the overall standings with 27 medals, including 10 golds. Hungary also performed strongly with 18 medals (eight gold), France managed 17 (seven gold) and South Africa, who dominated the 2017 event with home advantage in Cape Town, took home 15 (seven gold). The championships ended with a mass-participation charity team relay, and Ireland’s medal heroes signed off on a successful weekend by calling on more people of all ages to take up Laser Run with a view to progressing towards Modern Pentathlon. 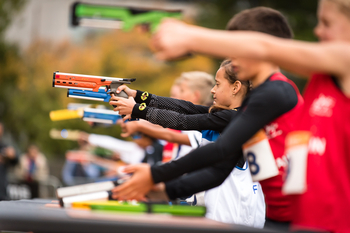 UIPM President Dr Klaus Schormann said: “The 4th UIPM Laser Run World Championships took place in Dublin in a wonderful green environment with nice weather and we saw exciting competition across all age groups. 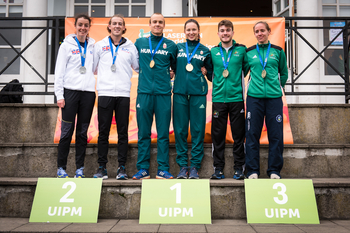 Viacheslav Malishev, UIPM Executive Board Member for Development, added: “We had a wonderful festival of Laser Run here in Ireland, the organising committee did a great job and we saw young athletes really enjoying this fantastic field of play at the historic Trinity University. “It was a nice achievement to have 28 countries here and I’m quite sure that in future we will have a bigger number. We saw people coming from India and Bangladesh, strong performances from the African continent as usual, Burkina Faso was here and that was very nice. Paddy Boyd, CEO of Pentathlon Ireland, paid tribute to all involved in the organisation of a weekend that “firmly put the sport of Laser Run on the map”. “The 2018 Laser Run World Championships were a great triumph and our thanks go to our fantastic volunteers and staff who worked so hard to make it a success. “Trinity College Dublin was a magnificent venue for this global sporting event, which attracted more than 400 athletes from 28 countries to our capital city. “The profile of Modern Pentathlon has already grown considerably in this country thanks to the performance of our elite athletes, especially our Olympians and World Cup medallists Natalya Coyle and Arthur Lanigan O’Keeffe, and the support we have received from Sport Ireland. All results from the 2018 Laser Run World Championships are available here .